Aliye has two beautiful children but an unhappy marriage. 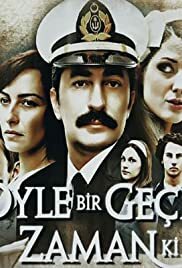 When Aliye discovers that her husband Sinan is cheating on her with a younger girl, she decides to leave the house and go to her uncle's house in Istanbul. Betus the fairy, meets human-being Sadik whose wife passed away, and fall in love with him. They try to build a happy family with Sadik's 2 sweet child but Betus's mother Dudu never let them to be happy. "The Paradise Quarter" is located at the outskirts of Istanbul. A place abundant with dance, music and love. The most beautiful girls, the most swaggering young men, the most talkative, nice and emotional people are living here. Narrating the story of a married couple on the verge of a divorcement and their relationship with their son, daughter, and their friends as a classical sitcom. A young man tries to rebuild his life after losing his family in the 1999 Yalova Earthquake. On the first glance there might be some apparent cliché episodes but the story goes deeper and deeper... It may not have the best TV serial scenario but the perfect cast what makes you stick to the screen on behalf outstanding and realistic performances.